The Startup Track from the World Health Summit gives young entrepreneurs the opportunity to present their innovative, healthcare-related business concepts to world leaders in science, industry and politics. Out of 73 entries from 22 countries, 10 finalists have been awarded with this unique chance to pitch their ideas. Also chosen were the 15 shortlisted startups who will be invited to attend this year’s summit. eobiont, as the strategic partner to the WHS Startup Track, is taking care of the participants before and during this exciting event and preparing them for the pitch. The winner of the Startup Track will be announced this year by German Minister of Health Hermann Gröhe. Congratulations to all! 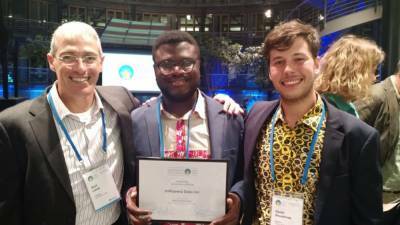 In this photo: The 2015 Startup Track winner Gregory Rockson (middle) with WHS participants. This year’s summit will take place this October at the German Federal Foreign Office in Berlin.